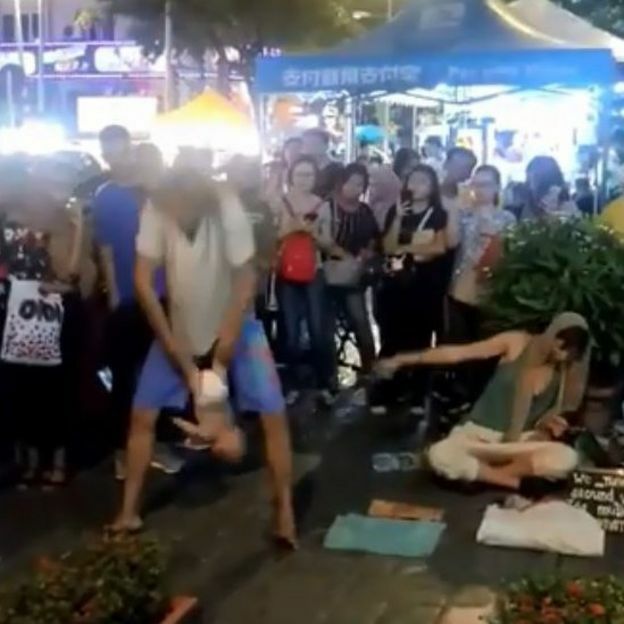 Two Russians have been detained in Malaysia over a street act which involved swinging their baby by the legs and throwing it up into the air. The pair are being questioned over alleged abuse of the four-month-old girl, police told news agency AFP. A video of one of their performances has gone viral over the past days, prompting the police to act. The parents, in their late 20s, are travelling across South East Asia as buskers. The 90-second video was uploaded on Facebook by a user who described it as an “irresponsible act that can literally cause injury”, urging that police should arrest them. The clip shows a man holding a baby by the feet, swinging it between his legs and raising it above his head. He also throws the baby into the air several times, briefly letting go. Next to him are a group of other Europeans playing instruments and chanting. The Facebook post has been viewed more than 28,000 times. Facebook said it had not taken it down because “it may help with rescuing the child in question”. The video can still be viewed online but with a warning that it “may show violence against a child or teenager”. 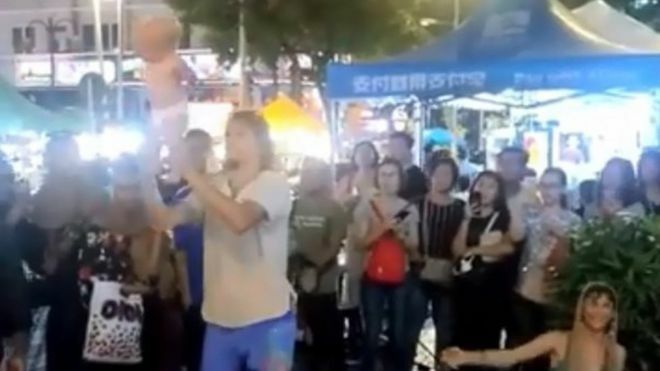 Police detained the couple during another performance on a street in Kuala Lumpur. “We detained them on Monday for questioning over the alleged abuse of their four-month-old baby girl,” Kuala Lumpur police chief Mazlan Lazim told news agency AFP. He told local reporters the baby was unharmed, with no sign of injuries. Most comments on the Facebook thread express shock at the treatment of the baby and that the parents use their child to make money. One comment says similar baby gymnastics are legal in Russia. While controversial also in Russia, some believe the exercise helps the baby develop more quickly. The Russian embassy in Kuala Lumpur told FMT they would contact the family. “We feel it is not right to draw attention or behave in this manner, to swing the baby,” a spokesperson said. Other comments also express their anger that the couple appears to be travelling around South East Asia begging for money. There’s been a growing trend of Westerners travelling in poorer Asian countries begging for money and other support to sustain their trip. Often referred to as “begpackers”, they’re increasingly a source of confusion or anger for local populations.